Louis John DiMuro was born in Brooklyn, New York on April 24, 1931. He went to high school in Jersey City, New Jersey then served in the Air Force where he broke a finger ending his baseball playing days. DiMuro then went to Umpire school and made his way to the Major Leagues by 1963. DiMuro lived in Floral Park , New York on the Queens / Long Island border in the sixties before moving to western edge of New York State, at Westfield, New York- “the grape juice capitol of the world”. Some of his most notable games behind the plate were the 1965 & 1967 All Star Games. In 1969 he called Baltimore Orioles pitcher Jim Palmers no hitter. DiMuro did his first World Series in 1969 & was the home plate umpire for Game #5 at Shea Stadium as the Amazing Mets won the worlds championship. Earlier in the game Baltimore's Frank Robinson claimed he had been hit by a pitch & argued he should be awarded first base. DiMuro disagreed. 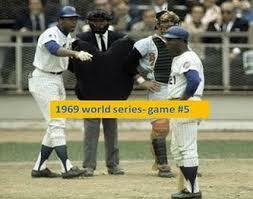 In the 6th inning the Mets' Cleon Jones claimed he was hit in the foot by a pitch that had bounced off his foot. 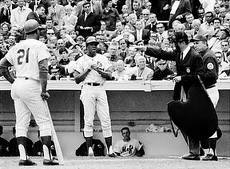 Mets manager Gil Hodges then came out of the dugout showing Umpire DiMuro, a ball with shoe polish smudged on it. Hodges claimed it was the ball that hit Jones' shoe, DiMuro agreed & awarded him first base. Orioles manager Earl Weaver came out to argue, but DiMuro reminded him to be careful since he had been ejected from Game #4. The next Mets batter Donn Clendenon hit a two run HR bringing New York within a run. The rest is Mets history. DiMuro went on to umpire in the 1976 World Series as the Big Red Machine swept the AL New York team, as well as doing ALCS in 1971, 1975 & 1978. 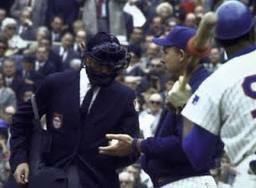 He was one of the last umps to use the famous outside chest protector behind the plate. DiMuro was slowed down by a hip problem but refused to retire in the early 1980s. Tragedy: In 1982 after calling a game between the Texas Rangers & Chicago White Sox in Arlington, he went out to dinner with Seattle Mariners manager Darrell Johnson, who also managed the 1975 AL Champion Boston Red Sox. After choosing to walk back to the hotel DiMuro was struck by a car and passed away two hours later in an Arlington hospital, he was 51 years old. He is buried in Tucson Arizona, where had lived since 1976. 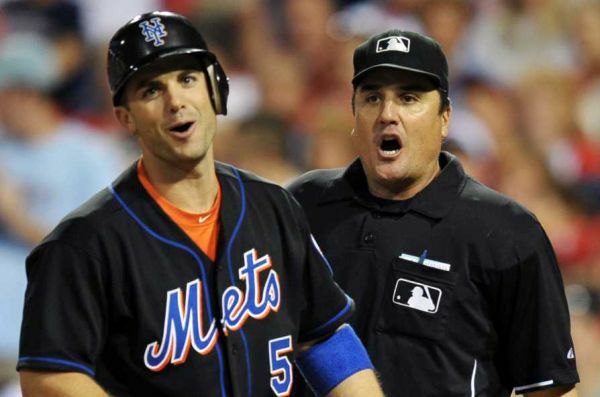 Family: DiMuro had five children, two who also became umpires. His son Mike DiMuro has been an MLB umpire since 1999. Michael Ryan DiMuro was born on October 12th 1967 in Dunkirk, New York. He followed in his Dad's footsteps becoming a professional baseball umpire. He worked in the Arizona League (1991) California League (1992) Texas League (1993-1994) American Association (1995) & Pacific Coast League (1996-1998). He then became the first American Umpire to work in Japan's Baseball League in 1999. But he left after finding out how umpires are not respected in Japan, when he ejected a player from a game & had the whole team surround him yelling & shoving him. Mike DiMuro joined the Major Leagues in 1999. 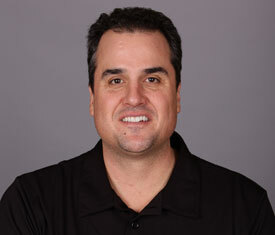 He worked two Division Series (2000 & 2010) as well as the 2005 All Star Game in Houston, Texas. 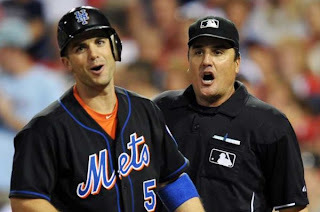 On May 29th, 2010 he was behind the plate for Roy Halladay's perfect game, joining two other sets of father / son umpires to have worked behind the plate for no hitters.